School superintendents in rural Washington are trying to improve the chances that their high-school graduates go to college, but they're up against the state's geography and climate. Traditionally, mainstream conversations about getting more students to and through college center on factors like academics, engagement and scheduling. But, experts say, there’s a missing ingredient: geography. Especially in the West, many states have “education deserts” — areas where the nearest college is a long drive away, and where the number of students who go to college after high school is low. 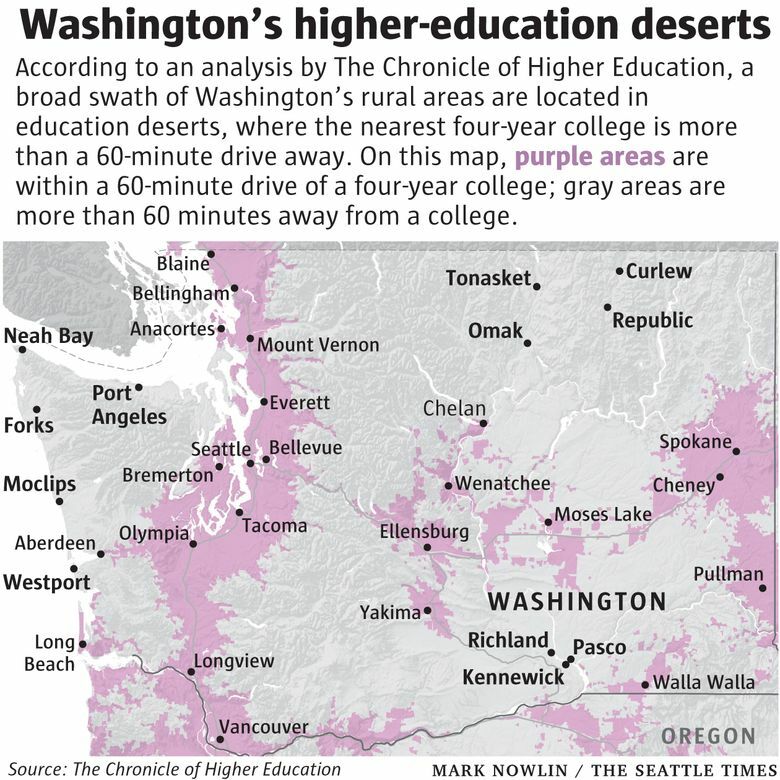 According to an analysis by The Chronicle of Higher Education, Washington is one of 11 states where 10.1 to 20 percent of the population lives in an “education desert,” where it’s at least a 60-minute drive to get to a college campus. The distance from college is key, the Chronicle notes, because most students stay close to home to earn a degree. In 2016, almost 40 percent of first-time, full-time freshmen said their colleges were less than 50 miles from their homes, according a national study of college freshmen. In Washington, rural superintendents are working to try to get more kids to be better prepared for college or some type of degree after high school, said John Glenewinkel, the superintendent of both the Curlew and Republic school districts in Ferry County, one of the state’s northeastern counties. Ferry County also has some unique challenges — among them, ferocious winters that make long-distance driving hazardous, and the lure of mining for gold. Spokane Community College does run a small program in Republic, the county seat, although it has reduced the number of class offerings in recent years. “But for many of my kids, that may as well be 100 miles away, because they don’t have transportation,” Glenewinkel said. And then there’s the problem of gold. Until recently, a productive gold mine in Ferry County allowed a high-school graduate with a good work ethic to make $100,000 a year as a miner. “The incentive to go to college was awfully low,” Glenewinkel said. Last year, however, the mine closed after it ran out of ore.
Curlew and Republic are part of the Rural Alliance for College Success, a group of 84 school districts — most in eastern Washington — that have banded together “to try to equalize the playing field a little for our kids,” Glenewinkel said. For example, the group pools resources to offer college-preparatory classes, like calculus or Spanish, in high schools. “We want to make sure geography doesn’t limit the opportunities for our kids,” he said. In the nearby Tonasket School District, another part of Washington’s “education desert,” the closest college is a branch of Wenatchee Community College, located in Omak, said Superintendent Steve McCullough. The school district offers “College in the High School,” a dual-credit program that allows students to take college-level classes and earn credit while in high school. The district’s focus is to make sure its students are prepared for college, if they choose to go. The Chronicle’s analysis found that 11.2 million adults live more than a 60-minute drive from a public college. Most education deserts are in low-population Western states. There’s no easy solution. But some experts suggest that, for a start, educators need to make location a bigger part of the conversation about college.